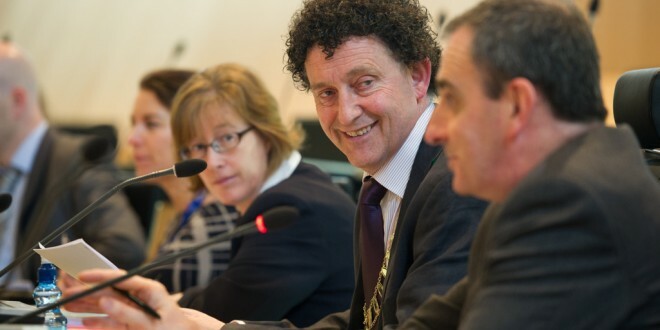 Fine Gael Councillor, Johnny Flynn is the new Mayor of Ennis has said he will not take the allowance of €12,000 that goes along with the mayoral chain. He was elected to the position at the inaugural meeting of the Ennis Municipal District on Tuesday afternoon. The role of mayor carries a maximum stipend of €12,000 and it was agreed at the meeting on the proposal of Councillor McNamara that the maximum allowance be allocated for the position. However, speaking after the meeting Councillor Flynn said that he would not be drawing down this stipend as per his election promise not to take any allowances or expenses. He explained that as he lives within a mile from the council chamber, he does not incur the same kind of expense as some full time councillors who live outside the town bounds. He said he hoped to work with his fellow councillors to see if the allowance allocation could be redirected to other sectors such as topping up sports grants or the arts. He added he did not expect nor wish other councillors taking up the mayoral role in future to do likewise. While, the position of mayor has been abolished in most towns, it can be retained in towns where the population is in excess of €20,000. The other council members in the Ennis area include Mary Howard and Paul Murphy of Fine Gael, Tom McNamara, Pat Daly and Clare Colleran of Fianna Fáil and Independents, James Breen and Ann Norton. The newly elected mayor was presented with a new chain of office by Director of Service Ger Dollard. The previous chain, which was inscribed for Ennis Town Council featured the name of each mayor on each link. This chain, along with other mayoral chains no longer in use will be put on public display at Aras Contae an Chlair. The last time a new chain was required was 14 years ago when Ennis Urban District Council became Ennis Town Council. Councillor James Breen was elected as deputy mayor on the proposal of Councillor Tom McNamara and seconded by Councillor Pat Daly. The incoming mayors for the remaining term of office will be Councillor Pat Daly in 2015, Councillor Ann Norton in 2016, Councillor Paul Murphy in 2017 and Councillor Clare Colleran Molloy in 2018. Mayor Flynn said he was “proud” to be elected as the new mayor for the newly aligned municipal district. He spoke of the tremendous support his family, who were present, have given him and commented that he and his wife Catherine were now married 25 years.